The story of Jonah and the Whale teaches such important life lessons as forgiveness, acceptance, and mercy. 1. Jonah was a prophet in the land of Israel. One day, God said to him: "Go to the city of Nineveh and warn it's citizens that they must stop behaving badly." 3. He boarded a ship heading to Tarshish (today's Spain) and fell asleep. Shortly thereafter, a great storm arose and threatened to tear the ship apart. The sailors, in attempting to save the boat, threw all the extra cargo overboard and prayed to their gods; however, the storm only grew worse. They believed that one of their gods was angry with one of the ships passengers, and drew a lottery to find out who it was. The lot fell on Jonah. 4. The sailors questioned Jonah who he was and he replied: "I am a Hebrew and I worship God, the God of Heaven, who made the sea and the land. I am running away from Him because I disobeyed His command." 6. "Pick me up and throw me into the sea," Jonah replied, "and the sea will become calm." 7. The Lord sent a whale that swallowed Jonah and, henced, saved him from drowning, just as God had desired. 8. 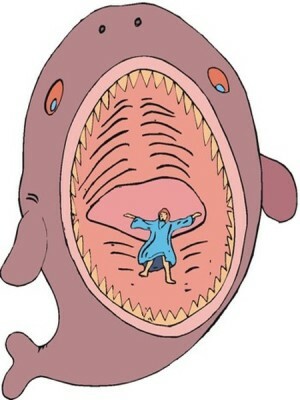 Jonah stayed inside the whale for three nights and three days, during which time he asked God for forgiveness. 9. The whale spat up Jonah on dry land. 10. Jonah then traveled to Nineveh and warned it's citizens. 11. The inhabitants of Nineveh changed their ways and God spared their lives. *Some say Jonah did not think that God should spare the lives of people who did not believe in him, while others believe he was afraid the citizens would harm him. People were created in God's image. This is not to say that we look like God from the outside but from within. Our great virtues are similar to our creator's. In the story of Jonah and the Whale, God is clearly forgiving. He is willing to spare the lives of the people of Nineveh even though they are not His worshipers, and He also forgives Jonah for disobeying Him. Discuss with the children the importance of forgiveness in our everyday lives. Jonah did not want to help the people of Nineveh because they were the enemy. We need to be more accepting of others and develop tolerance to people who are different from us.